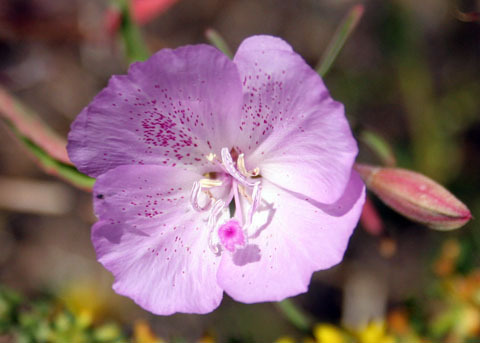 Four-part pink stigma extends beyond anthers; Four long and four short stamens. Outer anthers lavender, inner anthers yellowish. Limestone Canyon Wilderness Park, Orange Co., CA. 6-4-11. © Joan Avise. 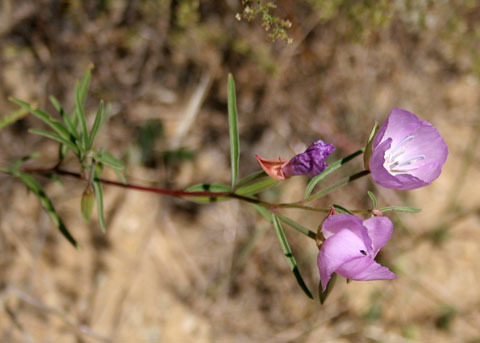 Clarkia is comprised of erect, late-flowering annuals. 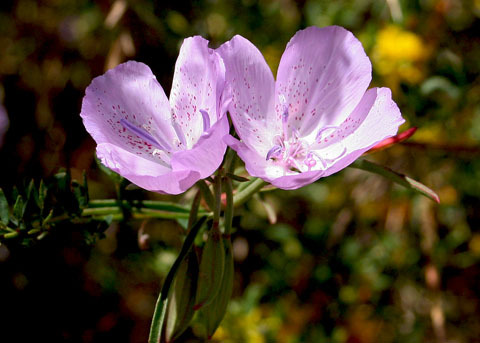 The stigma is divided into four lobes. 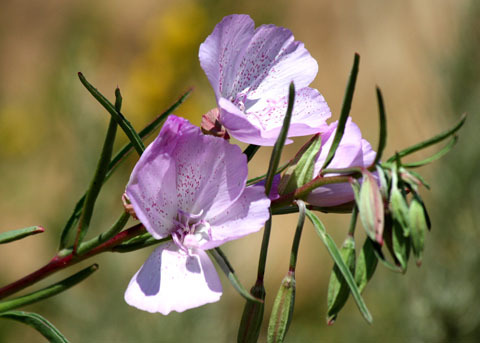 C. bottae is a 1-3 ft. erect annual, frequent on open places in Santa Ana Mtns, and occasional in mountain foothills. 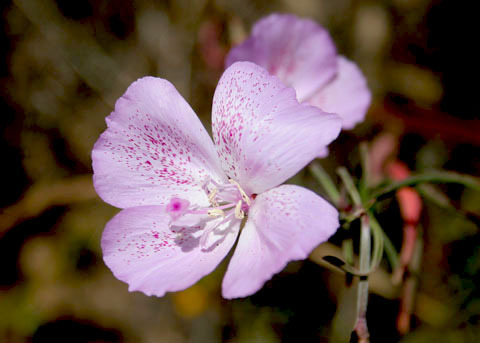 Four red-flecked pink, lavender or white petals often white-blotched at base. Limestone Canyon Wilderness Park, Orange Co., CA. 6-4-11. © Joan Avise. Limestone Canyon Wilderness Park, Orange Co., CA. 6-4-11. © Joan Avise. 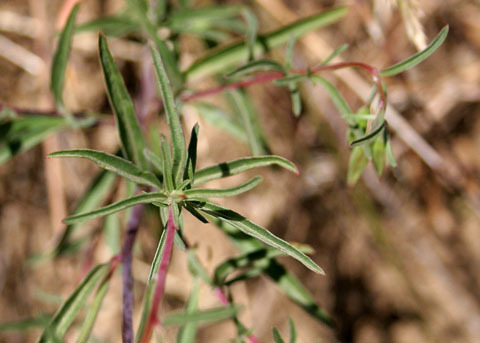 1-3 in.nearly linear leaves; 'nodding' buds on right. Limestone Canyon Wilderness Park, Orange Co., CA. 6-4-11. © Joan Avise. Four greenish united sepals which split on one side when the flower opens. Limestone Canyon Wilderness Park, Orange Co., CA. 6-4-11. © Joan Avise. 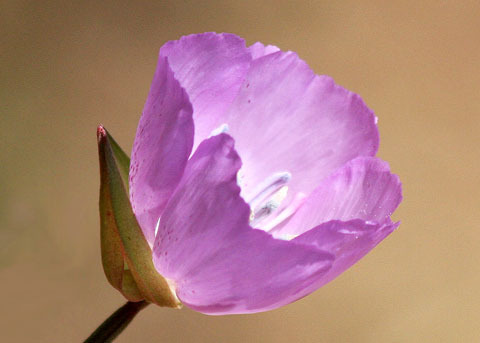 Nodding flower buds; flowers erect. Limestone Canyon Wilderness Park, Orange Co., CA. 6-4-11. © Joan Avise. 6-4-11. Limestone Canyon Wilderness Park, Orange Co., CA. 6-4-11. © Joan Avise.